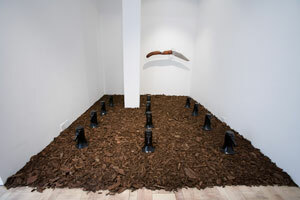 Mohau Modisakeng (Johannesburg, 1986) presents iButho, the first Side Gallery project for 2010. The show builds on a body of work that Modisakeng produced for his final year examination at Michaelis, in November 2009. 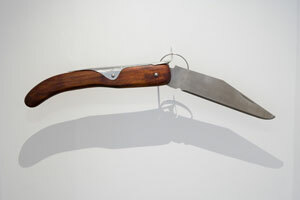 In his graduate exhibition, Modisakeng showed Untitled (Okapi), a oversize replica of a knife popular with tradesmen and gangsters, alongside other seemingly disparate objects: wall-mounted wooden megaphones, a large speaker placed on top of a circle of compost, and enlarged snuff boxes, also sculpted out of wood. In addition to two photographs, a sound piece, and a video, it created an elusive narrative, the suggestion of an event, possibly violent in nature, encoded in the works. "History, like compost, is a mass of dead decaying matter, yet it serves the purpose of assisting in the process of growth. Similarly, the history of South Africa is burdened by the idea of death; death in regard to the lives lost in the struggle, or death in regard to the act of forgetting, or rather pretending to forget that part of our history." Placed on the compost stage, there are twelve objects, unmistakably the shape of megaphones, an instrument used on both sides during protest marches, by protesters and by police and army. They are static objects, made out of wood, and unable to produce sound. The grid-like arrangement suggests the presence of an army, as does the title: iButho is a Zulu word denoting a military regiment. At the opening, twelve young black men will take up the positions of the megaphones, dressed in identical black shorts, a uniform that is not a uniform. This army, as silent as the megaphones they temporarily replace, at once embody the violence of South Africa's history and, through their youth, suggest potential, and maybe even hope. The exhibition opens on Thursday 21 January, 6-8pm. The gallery is open from Monday to Friday, 9am to 5pm, and Saturday 10am to 1pm.